Toronto, Ontario, May 29 (FSCwire) - Mongolia Growth Group Ltd. (YAK - TSXV and MNGGF - USA) ("MGG") or ("the Company") www.mongoliagrowthgroup.com, a real estate investment and development company participating in the dynamic growth of the Mongolian economy via ownership of institutional-quality commercial property assets in Ulaanbaatar, Mongolia, announces the acquisition of a centrally located retail center along with an adjoining development site in two separate transactions. The total cost of the two transactions is approximately CDN $8,300,000 consisting of approximately CDN $5,950,000 in cash and the transfer of MGG's two largest "held for sale" assets along with one of its development sites. It is expected that this transaction will be accretive to cash flow beginning in early 2015, as the three assets transferred in this transaction produced negligible operating income over the past year. MGG is currently finalizing plans to modernize and expand the recently acquired building structure and development site into a bustling retail shopping center. 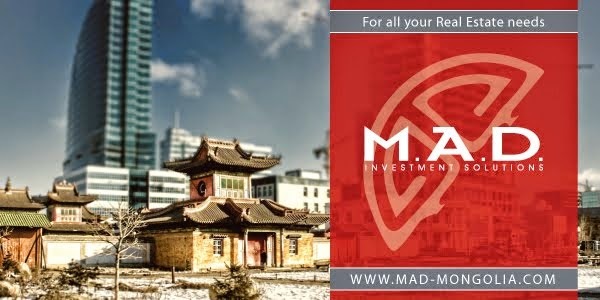 "This transaction is the culmination of nearly nine months of negotiations and due diligence, where we have swapped mostly non-core assets for a premium retail asset and contiguous development site in downtown Ulaanbaatar," said Harris Kupperman, Executive Chairman of MGG. "We are true believers that Mongolia's economic development over the next few decades will fuel a retail spending boom. Following the success that we have experienced with our previous redevelopments, we intend to upgrade the existing building, expand its footprint and make it one of the busiest retail centers in Ulaanbaatar." "From a strategic and operational standpoint, it is substantially easier to manage one larger asset, compared to three smaller ones," said Paul Byrne, CEO of MGG. "This transaction continues our process of disposing of smaller and marginal assets while we upgrade our portfolio into high quality assets in prime locations. In the case of this asset, we have the potential to achieve accretive cash flows while we await the full blue-sky development potential of the site. By Kim Iskyan, May 23, 2014 (Stansberry & Associates Investment Research) In the center of Ulaanbaatar, just a few hundred yards away from an enormous statue of Genghis Khan, sits one of Louis Vuitton's most successful stores in Asia. The luxury retailer moved into the capital city of Mongolia in 2009. Sitting in an Italian restaurant overlooking a temple, a foreign businessman who had been in Mongolia's capital for years told me the party to launch the store cost a few million dollars. It sold out of its entire inventory within the first three months of operation. That's unheard of – especially for a city where, at the time, the average citizen earned as much per year as someone in Sudan makes today. The over-5,000-square-foot store sits at the entrance of one of the city's most prominent skyscrapers. Nestled among the city's skyscrapers are dozens of small stores – from pizza shops and coffee houses to Irish pubs. There are also several fancy-looking malls and boutique stores with prices at least as high as you'd find in New York. Construction cranes are on just about every corner of this small city. The streets are so clogged with cars – including plenty of BMWs and Range Rovers – that it's often faster to walk than drive. I abandoned the taxi that was driving me back to my hotel in favor of walking several times. Ulaanbaatar is a testament to the growing wealth of Mongolia. You see, the country is sitting on some of the world's richest earth. According to some estimates, the value of Mongolia's natural resource deposits could reach $2 trillion – the equivalent to the gross domestic product (GDP) of Italy for a year. Thanks to its natural resources, Mongolia is one of the world's fastest-growing economies. In 2011, Mongolia's economy grew by an incredible 17.5%. And the International Monetary Fund (IMF) forecasts that Mongolia will continue to be one of world's fastest-growing economies over the next decade. But just 10 minutes outside of Ulaanbaatar, people live in small houses and gers (a felt tent typical in Central Asia) without running water or paved roads. Around a quarter of Mongolians live in poverty today. Average GDP per capita (the value of the country's annual production divided by number of citizens) is $3,700. By comparison, the U.S.'s is $41,749. But in time, the Mongolians living in poverty are going to move up the socioeconomic ladder... and into the 25,000 or so apartments that are built every year in Ulaanbaatar. That's where this month's opportunity lies – in the booming Ulaanbaatar real estate market. Prevailing terrible sentiment toward Mongolia means that investors aren't giving the country a second glance. Because of that, we can buy shares in a company well-positioned to capitalize on Mongolia's growth story – for just a fraction of what the shares will be selling for in a few years. But before we get into this month's recommendation, let's take a deeper look at Mongolia. When I visit a market, sometimes I have a difficult time finding the right investment opportunity. Even if the market overall is attractive, shares of specific companies I like might be too expensive, or a stock might not be liquid enough (that is, the shares don't trade much), or I might not trust the management. With Mongolia, I faced other challenges. A number of traded stocks are more directly linked to big-picture drivers – like commodities prices – than to the internal dynamics of what's going on in Mongolia. There's nothing wrong with that... but it's not how we're looking to profit from Mongolia's catalysts. I want to recommend a stock that's more driven by the growing wealth of Mongolians, rather than by commodities prices (even though the two are closely linked). One of its other main focuses is redevelopment projects... where it buys buildings and either knocks them down and starts over, or else renovates them beyond recognition, and then rents the properties. Many of these sites are on prime real estate on Peace Avenue. And there's a lot of redevelopment work to be done. "When you look at all the old Soviet buildings here, it's pretty clear that the entire city will have to be recycled over the next 20 or so years," a real estate professional who doesn't work for MNGGF told me. But real estate is a much easier business if real estate prices are on the rise. This has been, and will continue to be, the case in Ulaanbaatar for years to come. With overall economic growth rising, people have more money... and they want to spend it in restaurants and stores. That helps push up rents. Rising wealth also attracts international companies. There's an Ermenegildo Zegna, a men's luxury store, next door to Louis Vuitton. There are other high-end luxury retailers on the way. You can get fried chicken at just one KFC in town... but it's only a matter of time before McDonald's and Starbucks find their way to Ulaanbaatar. And they're all going to want to be on Peace Avenue. As a result, MNGGF has seen its rents move up 34% over the past year in local currency terms... and that's just the beginning. 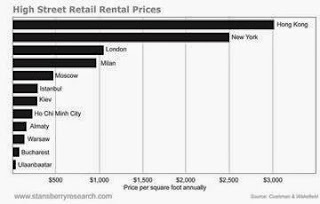 Rental rates for retail real estate on the high street in Ulaanbaatar are still just a small fraction of rates in other emerging markets' high streets. Even in a rising price environment, it's still easy to make a mess out of investing in real estate, though. You can get ripped off if you don't know the market... contractors and builders can cheat you... your own employees might be in business against you... you might wind up with deadbeat tenants… or you might get nickel-and-dimed to bankruptcy through petty corruption. These potential challenges are magnified if the market turns against you. Turquoise Hill Update: Oyu Tolgoi Advancing, SouthGobi Being Sold? May 29 (MIBG) Changes in Oyu Tolgoi's work force hit the market yesterday, resulting in a 2.41% drop on the TSX and a 2.36% drop on the NYSE for Turquoise Hill Resources Ltd. (TSX:TRQ). Given the current economic situation in Mongolia, the timing of such an announcement could have been better. That said, this announcement should not have been a surprise. With the open pit in full production and the underground delayed until late September there is no need for OT to maintain inflated employment numbers. Thomas Youngman, Co-Founder and Managing Partner of Mongolia Talent Network commented on the situation: "While the lay-offs are deeply unfortunate for those involved, it is no secret that there is a massive shortage of skilled labour in Mongolia relative to the potential demand. If the Government is able to make a significant push forward in the second and third quarter of the year, we believe the majority of the displaced workers could have excellent employment prospects, benefiting from the experience and training gained while at Oyu Tolgoi." We agree with Thomas' views, and feel that this group of individuals represents one of the most highly skilled labour forces in Mongolia. With amendments to the list of Strategic Deposits, Centerra's Gatsuurt could be one such project. Through a Strategic listing, Gatsuurt would be able to move forward in spite of the challenges that the project faces through the water and forest act. That said, as a result of the downturn over the past 36 months few other projects require such skilled labour. Needless to say, swift and purposeful Government actions will be needed in order to reinvigorate Mongolia's mining sector. Outstanding factors such as amendments to the minerals law, and lifting of the moratorium on exploration licenses are essential for this to happen. Not to mention, a strong shift in investor sentiment to enable Mongolian focused companies to raise capital from the international markets. VANCOUVER, BC--(Marketwired - May 29, 2014) - Turquoise Hill Resources today announced the appointment of Steeve Thibeault as Chief Financial Officer effective June 1, 2014. Mr. Thibeault will replace Chris Bateman, who will be leaving the company to pursue other opportunities. Mr. Bateman and Mr. Thibeault are working together to ensure a smooth transition. Kay Priestly, Turquoise Hill Chief Executive Officer, said, "Since his appointment in May 2012, Chris has successfully led Turquoise Hill's financial strategy. I want to thank Chris for his leadership and significant contributions during his tenure as Chief Financial Officer. "Steeve is an accomplished financial leader in the mining sector and he brings a wealth of experience to Turquoise Hill. He will make a strong addition to our management team and I look forward to his contribution." Mr. Thibeault brings more than 30 years of extensive financial and corporate experience to Turquoise Hill. Most recently, he was Chief Financial Officer of Australian Stock Exchange-listed Energy Resources of Australia. Prior to that role, Mr. Thibeault held various mining and manufacturing roles with Rio Tinto Alcan and Alcan Aluminium Limited. May 29 (Bloomberg) -- Mongolia says it does not support Rio Tinto's decision to fire hundreds of workers at the troubled Oyu Tolgoi mine. The government is set to meet O-T executives in an effort to reverse the move. Turquoise Hill, the company through which Rio controls the mine, fell the most in five weeks overnight. Bloomberg TV Mongolia's Duuya Baatar reports from Ulaanbaatar. May 30 (Proactive Investors) Newera Resources (ASX: NRU) has commenced a ground magnetic survey at the Ulaan Tolgoi project in the South Gobi basin in Southern Mongolia. The ground magnetic survey will comprise 700 line kilometres covering the northern sector of the Ulaan Tolgoi licence area and is expected to be completed within two weeks. Newera has noted that the recent discovery of a black coal bearing sub-basin immediately adjacent to the northern boundary of the Ulaan Tolgoi licence, and the testing has produced shallow, mineable intersections of high quality black coal. Newera is utilising the services of the same geophysical survey contractors whom conducted the ground magnetics survey immediately to the north of Newera's Ulaan Tolgoi Licence, and were also the group that outlined the nearby black coal bearing sub-basin. The 43,000 hectare Ulaan Tolgoi project is located in the South Gobi province of Mongolia, 100 kilometres from the Chinese Border. Minor coal outcrops and a number of water wells along the Nariin Sukhait thrust fault 300 kilometres to the west of Ulaan Tolgoi led to the discovery of the large MAK and Ovoot Tolgoi coking/thermal coal deposits. May 30, Haranga Resources Ltd. (ASX:HAR) We advise that the Resolutions contained in the Notice of Annual General Meeting were approved at the meeting of shareholders on a show of hands. Ulaanbaatar, May 29 /MONTSAME/ At the Stock Exchange trades held Thursday, a total of 35 thousand and 115 shares of 15 JSCs were traded costing MNT 13 million 145 thousand and 280.00. "Remikon" /28 thousand and 250 units/, "Nako tulsh" /2,000 units/, "Silikat" /1,905 units/, "Mongolia Development" /1,686 units/ and "State Department Store" /649 units/ were the most actively traded in terms of trading volume, in terms of trading value--"Remikon" (MNT four million 237 thousand and 500), "Talkh chikher" (MNT two million and 449 thousand), "Material impex" (MNT two million and 025 thousand), "Mongolia Development" (MNT one million 146 thousand and 480) and "Bayangol hotel" (MNT 765 thousand). The total market capitalization was set at MNT one trillion 529 billion 713 million 051 thousand and 236. The Index of Top-20 JSCs was 15,000.77, decreasing by MNT 89.91 or 0.60% against the previous day. May 29 (MSE) To Mongolian Stock Exchange, "Mogoin gol", "Gutal", "Teever darkhan" and "Mongol alt" joint stock companies were submitted their decision of dividends. As of 28 May 2014, 23 joint stock companies declared to distribute dividends total of 11.14 billion MNT. May 29 (Mongolian Economy) Privatization has become a key issue in the Mongolia agenda, as businesses try to figure out new ways to bring in money into the economy. As investors seek opportunities within Mongolia's borders, it is important to provide them with advantageous prospects in order to help revitalize the Mongolia Stock Exchange to compete on the global scale. But what can we privatize in order to jumpstart the exchange? Nick Cousyn, the Co-chair of BCM Capital Markets Working Group, is focusing on the current state of the Mongolian Stock Exchange (MSE) and its relation to state privatization. He argues that there is strong support, both domestically and internationally, for state privatization. However, several questions remain unanswered about the lack of progress made: How will Mongolia get the investment necessary? Where will the assets be privatized? By using ETT as an example, Cousyn stated that the privatization of this company could provide a solid foundation for many future transactions to take place. There are two options to go about the privatization of ETT: MSE listing or international IPO. The problem with an international IPO is cost. To underwrite an international IPO, it costs at least USD 10 million with fees reaching USD 250 – 500K. This makes this option less likely. It also risks turning a financial transaction into a political one since markets value Mongolia assets at low levels. Rather than investing in an international IPO, an IPO on the MSE is a more profitable solution as costs will not exceed USD 250K. As a financially prudent option, it has large potential to attract foreign capital. 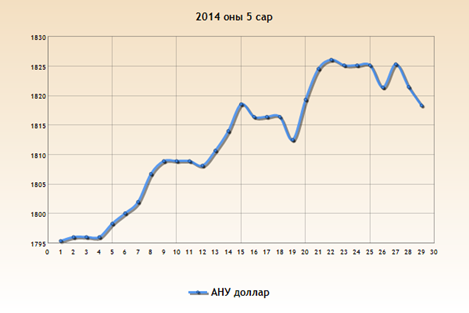 The market capitalization of the Mongolia Stock Exchange can increase at rapid levels to a possible USD 5 billion. Since MSE is does not serve the purpose of its investors, it makes it difficult for businesses in Mongolia to earn capital, thus extensive support is necessary. By privatizing ETT on the MSE, more companies will be added and add more favor to the valuations of the exchange. This will be the smart and feasible move for Mongolia to make in order to support its businesses. May 29 (Bank of Mongolia) On the Foreign Exchange Auction held on May 29th, 2014 the BOM has received bid offer of 0.5 million USD and 23.0 million CNY and ask offer of 4.0 million USD from local commercial banks. The BOM has not accepted any offer. On May 29th, 2014, The BOM has received MNT Swap agreement bid offer in equivalent to 53.0 million USD and USD Swap agreement ask offer of 5.0 million USD from local commercial banks. The BOM has accepted the MNT Swap agreement offer. Ulaanbaatar, May 29 (MONTSAME) Head of the parliamentary Standing committee on budget Ts.Davaasuren Wednesday received a delegation led by Mr Basil Kavalsky, a consultant to the World Bank (WB) on international development. Mr Kavalsky said he is here to see a working environment for the WB, explore ways of establishing contracts in spheres Mongolia wants to collaborate in. To this Mr Davaasuren said Mongolia wants to keep the cooperation with the WB, Asian Development Bank (ADB) and other largest financial organizations in order to ensure stability and to take long-term soft loans. Mongolia also aspires to receive big investments for the pasture animal husbandry and agricultural sphere, he added. "I reckon my country should keep companies with works and incomes, so we intend not to augment the state deficit by continuing receiving loans from other countries," Davaasuren said. Appreciating a focus on budget decentralization, Mr Kavalsky underlined that their bank managed to successfully implement many projects and programmes in Mongolia for a sustainable and rural development. Then the sides shared views on a present economic situation in Mongolia, its policy on the mining, assistance and loan matters. May 29 (UB Post) Last month the inflation rate reached 12.3 percent, according to the National Statistical Office. This is an indicator four percent higher than Mongolbank's hopes to keep the inflation rate at a single digit. Meanwhile, the inflation rate has rapidly risen (in the last four years inflation has increased by five percent), but the salaries, pensions and welfare benefits of Mongolian citizens have not increased at the same speed. Commodity product prices are becoming more expensive day by day, emptying citizens' pockets. However, the government seems to be ignoring this as if it is a common thing. The Agency for Fair Competition and Consumer Rights (AFCCR), which is in charge of protecting consumer's rights, is silent. However, the agency is the regulating body that should speak for citizens, demanding that product prices should not be increased considering the foreign exchange rate boost, and it is the authority which should take measures against people who fix prices. Russian company Rosneft will lower its oil prices for Mongolia. But this won't influence domestic retail oil prices. If the dollar rate hadn't gone over 1,800 MNT, petrol prices would have decreased by 400 MNT per liter. One Twitter user tweeted that one can't buy a bag full of groceries from the supermarket for 70,000 MNT. This means that the elderly who get a pension of 207,300 MNT a month will see harder times, only able to buy three bags of groceries a month. The Government of Mongolia and Central Bank are jointly carrying out several sub-programs to reduce the cost of commodities and imports, and to stabilize the prices of main food commodities. Under a project led by Mongolbank and commercial banks, soft loans of 77 billion MNT were granted to businesses in order to maintain meat resources. Even though measures have been directed at stabilizing the cost of petrol and meat, positive outcomes haven't been seen yet. Two months ago a kilogram of mutton with bone cost 6,500 MNT, while this week it reached 8,500 MNT and a kilogram of beef reached 10,000 MNT. This is a country with a population of around three million people and 45 million heads of livestock. The National Statistical Office is the only authority that determines the inflation rate, grounding it on 329 categories of products and goods. But they hesitate to explain how the numbers they arrive at are adjusted and correlate to citizen's standards of living. If they explain the essence of their statistics, we could learn factual information about the relationship between income and inflation. 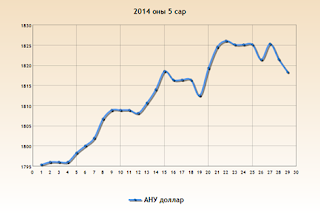 Private Mongolian companies incurred losses of 775 billion MNT because of current exchange rates. Last Thursday Eznis Airways stopped their operations temporarily, and now Oyu Tolgoi is cutting 300 jobs. The economy of Mongolia grew 7.4 percent higher in the first quarter of this year compared to last year. Shall we still believe that the livelihood of Mongolians will improve when the inflation rate is at 12 percent and economic growth is not positively influencing people's lives? May 29 (news.mn) The MPP caucus in Parliament decided that reckless cabinet ministers should take responsibility during Wednesday`s caucus meeting on May 28th. The opposition party first voted that the Minister of Economic Development N.Batbayar should take responsibility for the economy going into decline from a world-beating 17.5 percent in 2011 to 11.7 percent last year as well as consumer capability worsening day by day. MPP is expected to submit a request for the resignation of the Minister of Economic Development N.Batbayar and to hold a press conference regarding the issue today. The opposition party has delivered impeachments for several so called irresponsible cabinet ministers to the Government. However the Government did not comment on the issue, so the opposition has decided to take action with a move. MPP demanded the resignation of the Minister of Economic Development N.Batbayar and the Finance Minister Ch.Ulaan in December in 2013 but the ruling party keeps hold of them using their majority status. Ulaanbaatar, May 29 (MONTSAME) Members of the Mongolian People's Party's faction M.Enkhbold and S.Byambatsogt Thursday submitted to the Speaker Z.Enkhbold a draft resolution of parliament on dismissing incumbent Minister of Economic Development N.Batbayar. "He should be dismissed because he breached the law when realizing the general policy on investment, the policy and regulation over foreign investment, the policy and planning of loans and assistance, which are reflected in the law on economy," they said. "External debt of Mongolia's government has gone up sharply in the last two years, the cost of budgetary loan services increased 3-4 times, and a size of current debt reached USD 3 billion, exceeding by USD 800 million a total debt accumulated during the previous cabinets of 22 years," they said explaining the resolution. Ulaanbaatar, May 29 (MONTSAME) The news pieces about our actions against corruption and methods of the Corruption Combating Agency of Mongolia (CCA) broadcasted by the Bloomberg TV and other foreign media are completely groundless. A chairman of the investigation sector of the CCA P.Enkhtor said it during a meeting on Wednesday while presenting the organization's activities to its newly appointed public council. This matter was asked about by L.Tor-Od, a member of the council and head of the "Transparency International Mongolia" organization. These media broadcasted several news about Mongolia's jailing foreign investors, limiting their freedom. "The CCA has been named as a 'Stalin's doctrine", Enkhtor noted, "it is an attempt to perform works for the sake of their interests". In the last five years, the CCA's section investigated 24 foreign citizens--14 from China, four from South Korea, two from the USA, two from the Philippines, and one from Kazakhstan and Australia each. Two cases of them have been closed, four have been sent to the police, two have been abstained, and seven cases have been passed to the prosecutor for indictments, he said. Featured by the Bloomberg TV, a former president and executive director of the SouthGobi Sands LLC the US citizen Justin Kapla has been investigated due to avoiding paying a large amount of tax to Mongolia in 2007-2011. The company's financial authorities together with a lawyer Sarah Armstrong have been investigated after the evidence was cleared they had given bribery and breached our tax law. These were revealed during an investigation of a case of P.Batkhuyag, a former head of the Authority of Mineral Resources, he went on. "From the side of Mongolia's investigative service, everything has been done to have all adhere to the law, everybody--the Mongolian or a foreigner--has equal rights to be protected by the law but it must be obeyed first, in running business for example," Mr Enkhtor stressed. May 29 (infomongolia.com) The Government of Mongolia is adhering a policy on "New Railway" project and other projects to implement in future by introducing a Euro Standard. In this regard, the "Vosloh" and "Pandrol E-clip" rail fastening designs, which are used to fasten rails to concrete railway sleepers manufactured by British "Railway Moulds and Systems" company, are agreed to transfer to Mongolia in terms of free and term less of utilization. Moreover, the RMS Company agreed to use above rail fastenings designs on narrow gauge of 1435 mm, where Mongolia uses a broad gauge of 1520 mm and new projects being implemented will be using narrow gauges. The contract signing ceremony was held in Ulaanbaatar on May 27, 2014, where the Government of Mongolia was represented by Maritime Policy Implementation Regulatory Department Director at the Minister of Roads and Transportation Yo.Manlaibayar and the other part by RMS CEO Mr. Jonathan Layfield. In the scope of introducing above designs, it enables to use complete and high quality sleepers that are proven worldwide and recognized as robust, reliable, well designed and accurately engineered by British company. May 29 (infomongolia.com) The regular monthly "Transparent Mining" press conference was held on May 28, 2014, where the Ministry of Mining of Mongolia introduced the works completed in geology, mining and oil sectors last month and the 10 major tasks to carry out in 2014. <! [if !supportLists]>1. <! [endif]>To accelerate underground development of Oyu Tolgoi project. <! [if !supportLists]>2. <! [endif]>To increase profitability and enhance competitiveness of Erdenes Tavan Tolgoi (ETT) in foreign markets by providing an opportunity to involve domestic and foreign investors' participation. <! [if !supportLists]>3. <! [endif]>To implement a "SNG" project on synthetic gas release from a coal. By establishing a joint company to prepare Feasibility Study by August-mid of this year and to start the project construction works within 2014. The project financing estimates about 30 billion USD. <! [if !supportLists]>4. <! [endif]>To select a location for an Oil Processing Plant and provide preparations. <! [if !supportLists]>5. <! [endif]>To intensify works of four strategically important mineral deposits (Erdenes Tavan Tolgoi, Tsagaan Suvraga, Gachuurt and Asgat) to running into economic circulation in 2014. <! [if !supportLists]>6. <! [endif]>To intensify Petroleum Authority's activity, where several projects are enabled to implement following the ratification of Petroleum Law of Mongolia. <! [if !supportLists]>7. <! [endif]>To complete programs on rare earth elements, fluorspar, coal, zinc, gold and other mixed metals. To commence copper smelter and steel plants in the frameworks of "Copper" and "Iron" programs with collaboration with other Ministries. <! [if !supportLists]>8. <! [endif]>In the scope of amending the Law on Minerals, to recover 106 special licenses suspended and allocate relevant compensations to holders of these licenses for exploration expenses. <! [if !supportLists]>9. <! [endif]>To accelerate geological mapping of 1:50,000 scale and determine minerals resources findings by setting in the budget an increased volume each year for this program. <! [if !supportLists]>10. <! [endif]>The geology, mining and oil sectors require great amount of investment, thus it is in need to accelerate opening Minerals Stock that aims to develop Stock Market of Mongolia, which enables to raise fund for these sectors. <! [if !supportLists]>· <! [endif]>Implementation to the Law on Government of Mongolia prohibiting members of parliament being appointed as members of cabinet. The so called "Double Deel" law. From the proposed 25 issues, the key expectation investors had was amendment to the Mineral's Law, lifting of a ban on new exploration licenses and a solution to 106 exploration licenses issue. As soon as the Spring Session kicked off the "Double Deel" law drew the public's attention and resulted in the DP, MPP, and the MPRP caucuses taking their respective breaks, looking for political consensus among its members. While the DP caucus clearly wanted the law to be implemented in 2016 citing the importance or political stability, the MPP, MPRP, and some rogue DP members opposed the delay in implementation and wanted the law to be implemented immediately. The DP narrowly survived the parliament vote by a single vote to implement the law in 2016. If the "Double Deel" legislation was to be effective this year then 2/3 of the current ministers would be required to resign causing all sorts of short term chaos. We believe the concept of the "Double Deel" law will eventually professionalize the cabinet, while creating political responsibility and separation of powers, which will eventually benefit the private sector and bolster Mongolia's democracy further. In association with the "Double Deel" Law the Minister of Agriculture and Industry, Battulga submitted his resignation citing he supported the law to be implemented immediately. This creates another political stalemate as the Parliament and the DP look for his replacement and the competition among candidates is fierce. During the 2014 PDAC organized in Toronto, Minister of Mining admitted that policymakers' decisions affected foreign investment and the government would prevent repeating the mistakes. He also addressed amendment of Minerals law and revisions to the "Long Name Law" during Spring Session. In early May, Minister of Mining had proposed draft law on Amendment of Minerals Law to the Parliament's Spring Session. The draft law will maintain the original intent while setting new provisions for better regulation, and it included 6 subjects regarding economic impacts of Strategic Deposits, development of responsible mining, special licensing and its payments, rights responsibilities and relations with local government. The proposal had been approved by the parliament and entered first discussion of Economic Standing Committee and Environment, Food and Agricultural Standing Committee on May 28th. On May 30th, 2014 the proposed draft law will enter first discussion of Spring Session. We believe the amendments to the Minerals law, if approved on Friday the May 30th will relieve a major uncertainty for foreign investors and give further upside potential to all junior mining companies, which operate in Mongolia. As we have highlighted before, the companies that explore and mine for metals in Mongolia had gained approximately 40% on average YTD while those companies in coal area have depreciated by 30% YTD. We believe, Mongolia focused exploration companies are stuck with marginal assets that's struggle to obtain funding especially in regarding coal sector. Lifting the ban on issuance of exploration licenses will likely reward those who have been committed to Mongolia. Resolution of 106 license issue had been proposed to the parliament by the Ministry of Mining. The issue hasn't entered Spring Session discussion yet, however we do not foresee any major roadblock in the 106 licenses being issued back to its original owners on competitive tender process, it would incline positive signs that Parliament is taking actions to further promote private sector and ease uncertainties and negative sentiment towards Mongolia. <! [if !supportLists]>6. <! [endif]>Tightening budget and relooking at the monetary policy. While we believe these are all the right issues to tackle, it is not likely to carry and solve the 70 challenges in 100 days, where some of the issues could take more than 3 months to resolve. However, we do believe that these initiatives could steer the economy in the right direction in the medium to long term. In conclusion, even though the decisions had been slow to come from the Mongolian policy makers and often were distracted by political noise we are still moving in the right direction. After all no one said it was going to be a "slam dunk". May 29 (Mongolian Economy) As the population grows in Ulaanbaatar, transportation in and out of the city became more frequent. Thus, it is crucial to make sure the roads many travel through are safe. Due to a lack of proper road maintenance, car crashes and other accidents have skyrocketed, marking the dangers of travel. However, with help from outside resources, Mongolia can hopefully solve this problem and avoid further road damage in the future. Peter Benson, VicRoads Team Leader of the ADB Capacity Building Project, focuses on issues regarding road transportation in Mongolia. Road transportation has become a pressing issue as of late due to the dangers that many roads into and out of Ulaanbaatar provide. Routine maintenance and periodic maintenance are important issues that need to be tackled in order to create more sustainable roads. One of the most famous roads leads to Darkhan, but it is covered in potholes among many other obstacles. A little over two years ago, cars and trucks could easily maneuver their way around. Now transportation is almost impossible as vehicles constantly crash into each other on this dangerous road. According to Benson, 65% of the road needs to be repaired due to lack of maintenance and rapid deterioration. He argues that the private sector needs to be engaged as well as form a new development in the educational process. In order to create a new generation of skilled engineers to help with road maintenance, more experts are needed to come in, in addition to hands-on activities. Through skill and position assessment, Mongolia can hope to establish an international based delivery system to enhance its roads. Mongolian road maintenance is an awareness issue, not a financial issue. Getting funding to fix roads is not biggest problem. Rather, it is making it clear that fixing roads is a priority that needs to be focused on. With more realization, the roads in Mongolia can see a brighter future ahead. May 29 (Bloomberg) -- ING Groep NV sold the largest note linked to the credit of a Mongolian bank as the ratings of the country's lenders are at risk because of rapid credit growth. The Dutch bank marketed $8.1 million of three-month notes tied to the debt of Khan Bank LLC, the largest lender in Mongolia, according to data compiled by Bloomberg. The securities pay a 6.5 percent coupon and are also linked to the Mongolian tugrik. Khan Bank's credit rating may be lowered from a junk B1 grade because of a big increase in its loan book, Moody's Investors Service said in January. The Ulaanbaatar-based lender's assets grew 72 percent to 4.8 trillion tugrik ($2.6 billion) last year, according to its website. Mongolia's B1 sovereign rating, four steps below investment grade, may also be cut because of the financial system's rapid loan growth, higher external debt and dwindling foreign exchange reserves, Moody's said on May 26. The country's outside debt almost doubled to $18.9 billion in the two years to 2013, according to the report. Notes connected to the credit of Mongolian companies "tend to be more bespoke and can be structured by linking it to any exposure in the underlying name, not necessarily bonds," Srinivas Uriti, ING's Singapore-based head of emerging market trading and capital markets, wrote in an e-mail. He declined to provide further details of the debt connected to the notes. Ulaanbaatar, May 29 (MONTSAME) Production of minerals in Mongolia increased by 7.3%-46% against the last year, informs the Mining Ministry. The nation produced 305.8 thousand ton of copper concentrate, 1.2 thousand ton of molybdenum concentrate, 1.4 ton of gold, 6.9 million ton of coal, 92.2 thousand ton of fluorspar and 0.9 million ton of iron ore in the first four months of this year. For the same period, Mongolia exported 5.4 million ton of coal, 316.5 thousand ton of copper concentrate, 1.4 thousand ton of molybdenum concentrate, 2.5 ton of gold and 83 thousand ton of fluorspar. This means increases of 41% in copper concentrate, of 46.7% in gold, of 32.3% in oil products and of 7.3% in coal exports. Today, there are 75 companies operating in gold mines of Mongolia. Below is an article on VAT challenges being faced by businesses which is prepared by the TWG (Tax Working Group). Translation of this documentation is also provided for the English readers. The objective is to give an overview of VAT and the challenges being faced and also technical clarifications to recent discussions or controversy over VAT. Any comments and suggestions please feel free to contact TWG at erka@bcmongolia.org. Ulaanbaatar, May 29 (MONTSAME) AREVA Corporate Foundation is pursuing its commitment to improve education levels among the disadvantaged in Mongolia, according to its website on May 28. <! [if !supportLists]>- <! [endif]>the supply of 200 water storage drums fitted with faucets to store water. The Foundation, as it says, supports concrete, targeted and sustainable actions, especially those benefiting children, women and students. These actions focus on education, health and culture. May 29 (infomongolia.com) Mongolian National Chamber of Commerce and Industry (MNCCI) in association of the China Council for the Promotion of International Trade (CCPIT) and the Chamber of Commerce and Industry of the Russian Federation (CCIRF) will be organizing the 10th Trilateral Business Forum in Ulaanbaatar on June 12, 2014. The purpose of this 10th edition is to promote and interlink the three Chambers' business activities, implement a joint program and project, in terms of neighboring countries to solve jointly problems facing in trade and business, and connect businesses between three countries' entrepreneurs. The event has been hosted alternately by three Chambers and each time it has been organized in a broad range by involving all branches including provincial units. The 10th Mongolia-Russia-China Business Forum will be starting at 10:00 am at MNCCI building and the business representatives' meeting is planned to convene in Corporate Hotel next to MNCCI at 02:00 pm, where about 100 business delegates from Russia and China are submitted to attend. - Construction and building materials, including representatives of major companies to participate. May 29 (Oxford Business Group via UB Post) Efforts to highlight Mongolia's broad range of attractions are paying off, with the tourism industry on course to notch up a decade of sustained growth, a recently published report has concluded. In its overview of the Mongolian tourism industry for 2014, the World Travel and Tourism Council (WTTC) said arrivals, earnings and employment were all on track to rise over the next 10 years, on the back of significant investment. However, officials are aware that improved coordination between the public and private sectors in key areas, such as infrastructural development and marketing, will also play a part in supporting the industry's development. Mongolia's tourism sector generated 238 million USD in 2013, according to the WTTC's report, directly contributing 2.5 percent of GDP to the country's economy. The council expects overseas arrivals to be a key driver of growth, with numbers forecast to edge towards 700,000 by 2024, up 50 percent from an anticipated 456,000 this year. Tourism's overall input into Mongolia's economy is forecast to ease over the coming decade on the back of high growth levels anticipated in other sectors. However, direct revenue should increase by 6.3 percent annually over the next 10 years to reach 462 million USD, while the number of jobs available in the industry looks set to rise from 26,500 in 2013 to 31,000 by 2024. Figures are expected to show that Mongolia's tourism sector attracted 59.6 million USD in capital investment last year, which is forecast to rise by 7.3 percent annually over the next 10 years. The industry's overall share of national investment should remain steady at 10.5 percent, the WTTC concluded. While forecasts for the industry look promising, the government is keen to forge closer links with the private sector in its bid to better market Mongolia on a global platform. The authorities have traditionally concentrated on highlighting Mongolia's cultural attractions, such as its museums and craft activities, while private travel companies are, instead, targeting a new wave of tourists looking for an "off the beaten track" destination. Hiking, horse-riding, camping and off-road vehicle safari tours are among the broader range of activities that operators are publicizing. Representatives across the industry are keen to bridge current gaps by working to promote Mongolia in its entirety. Coordinating efforts will include broader consultation on infrastructure needs, transport and advertising. Mongolia's International Travel Mart 2014, which took place at the end of March, generated noticeably higher levels of interest among tour operators. Organized by the Mongolian Tourism Association, the event also brought increased regional representation, with 16 of the country's 21 provinces, opting to participate. The decision to sign up as the official partner country for the major annual travel trade show, ITB Berlin 2015, next March, should also support the government's marketing efforts. "We regard tourism as a long-term opportunity that diversifies our economy," P.Altangerel, State Secretary at the Ministry of Culture, Sports and Tourism said, commenting on the partnership in early March. "Mongolian companies are also very keen to actively cooperate with the international tourism industry." Tourism Minister Ts.Oyungerel told OBG that new legislation, which is currently being drafted, would help protect sites of interest, while also setting the scene for the government to invest in the sector. She also acknowledged that other challenges which mark the industry, such as seasonality, will need addressing. Mongolia's long and extreme winter has traditionally restricted the tourism season, making it difficult for operators to retain a qualified workforce. "Workers need to know that their job is reliable year-around and not seasonal," she told OBG. "This is why investment in winter tourism is essential to help us build capacity and develop attractive employment options for future leaders in the sector." New attractions, such as a dinosaur museum set to open in the summer, and improved travel infrastructure, led by a new international airport which should be operating by 2016, are signs of Mongolia's commitment to tourism expansion. A focus on extending the season will support efforts to drive further growth, enabling Mongolia to make full use of its abundant resources and develop the niche markets that are already generating significant interest. URBANA, Ill., May 29 (AP) — The University of Illinois will receive a $1.5 million grant from the U.S. Environmental Protection Agency to research how cleaner-burning cookstoves will affect air quality in Alaska, Nepal, Mongolia, and China. The EPA said Wednesday that the U of I was one of six universities to receive about $9 million in funding to investigate cleaner technologies and fuels for lighting, heating and cooking. The World Health Organization estimates that cookstove smoke accounts for over 4 million premature deaths each year. The EPA says almost 3 billion people are exposed to household air pollution from crude stoves. Such stoves are a major source of black carbon, which affects people's health and contributes to climate change. May 27 (Bloomberg) -- When Mongolia's government introduced a new mortgage law it not only helped more people to own homes, it also gave the country's construction sector a huge boost -- effectively creating a whole new market. That's no bad thing as Mongolia tries to move away from its reliance on mining to drive the economy. Bloomberg TV Mongolia's Dulamkhorloo Baatar reports. <! [if !vml]> <! [endif]>May 29 (UB Post) Mongolian engineers have manufactured ten more eco-friendly trolleybuses by order of the Ministry of Roads and Transportation (MRT). 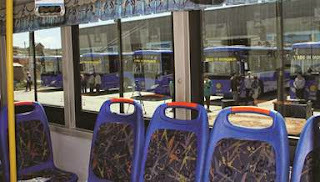 Each one was made for 150,000 USD and they are now ready for use in public transportation. The double-engine trolleybuses are capable of running on both fuel and electricity. They were officially presented on Thursday at Mongolian Electric Transportation Company. The MRT originally submitted an order for 12 trolleybuses, but only ten were manufactured due to the increased value of the USD against MNT. The fuel and energy consumption per 100 kilometers of the eco-trolleybus is ten times lower than that of an ordinary bus. The manufacturing of more trolleybuses in the future will benefit both the government and passengers in the long-run, and high-cost buses will eventually be eliminated from service. The eco-trolleybuses offer more convenience throughout the four seasons, reported officials. Old trolleybuses with poles that slip out of overhead wires and those that have experienced poor maintenance have started to be taken out of service. They will be completely eliminated from service by next year. When the power is out, the eco-trolleybuses will run on their diesel generators. The new trolleybuses will run on routes from the Officers' Palace to the Third and Fourth Micro-districts, Third and Fourth Micro-districts to Uildver Combinat, as well as Khaniin Material to the Officers' Palace for the standard fare. Deputy President of the National Union of Metallurgy and Machine Production D.Jargalsaikhan said at the presentation ceremony, "Our eco-trolleybuses will be sold for a minimum of 240,000 USD each in the international market. Mongolia produced its first trolleybus domestically in 2006. Since then, five types of buses and trolleybuses have been made in Mongolia, but the eco-trolleybus has been proven to be the most suitable for city service according to the experience of the past eight years." May 29 (UB Post) The Japan Fund for Poverty Reduction (JFPR) of the Asian Development Bank has been implementing several projects in Mongolia, and one of them is the Tuul River Recovery Project. A discussion on technical preparation for the project took place on Wednesday to launch the project and improve Tuul River's water quality as well as strengthen flood control. Chief of River Basin Area Division at the MEGD G.Ganbat said, "We are planning to do both mechanical and biological cleaning in the river as we have now easy access to required modern equipment. The first stage of the project is financed with a billion USD which will be spent on detailed researches." Minister of Environment and Green Development (MEGD) S.Oyun and Ambassador of Japan to Mongolia Takenori Shimizu joined the discussion. The MEGD will manage the project in collaboration with the Tuul River Basin Administration. Tuul River stretches over 700 kilometers and its 140 km are heavily polluted according to unofficial reports. Detailed research on pollution of Tuul River hasn't been done in the past 70 to 80 years. If the project aims are met, pollution accumulated for many years in the river will be cleaned, the Central Water Treatment Plant will be upgraded and the river basin area will be better protected and maintained. The project will proceed in two stages – the first stage is expected to take 15 months. Officials will conducted a detailed study on how efficient the toxic substance filters at the Central Water Treatment Plant is and how substances dumped in Tuul River can be completely cleared in the first stage, while the second stage will focus on conducting a one-time large-scale cleaning at the river's most polluted part based on the research, reported ministry officials. "In 15 months of the first stage, we will also study similar experiences of other countries and find the most suitable technology to clean Tuul River," G.Ganbat added. May 29 (UB Post) We spoke with L.Sanjaasuren, director of TChM LLC, who makes fences with recycled materials. There are few countries that keep trash underground like Mongolia. Every city administration has said they will build a recycling plant. But, in reality, nothing has happened. International approaches to waste management have turned away from landfills, which are used in Mongolia, and prefer the "Three Rs" principle (Reduce, Reuse, Recycle), which decreases waste and recycles it. Some developed countries focus on eliminating and recycling waste completely. But Mongolia has been saying "we will make money from waste" for 20 years, and "we will classify, use and produce" for ten years. Burying waste underground, in particular, in the city limits, is an ecological crime. The biggest source of waste is vodka and beer factories. The production of one bottle of vodka creates a kilo of waste. Honestly, waste management is a sector that has money; income, outcome and a budget. In other words, same as agriculture, cashmere, wool and forestry, it could be a micro lever for the economy. Unfortunately, there is not a relevant ministry for it and responsible workers. There is no policy, mission, promotion, or facilitation. Also, still now, no one initiates new ideas for it and goes after them. How many recycling facilities are located in Ulaanbaatar? There are specialists who take care of waste issues in the Ministry of Environment and Green Development. A team of six members works in the city, but none of them are specialists in recycling waste. There are over ten small facilities which conduct waste recycling, and TChM and San-Orgiu recycle waste and plastic bags. Since 2013, we have produced the eight following products: rail crossing gate posts, sanitary sewer grates, column fencing, and curb and green area railings. In total we have recycled over 300 tons of waste. Is it possible to extend your production? There is a machine and two small workshops in our factory. The technology is simple. By recycling waste, we make products which can be substituted for cement, armature, and wood. Furthermore, these products can meet customer's requirements. I have sought after enhancing our factory for seven to eight years and submitted many projects and programs to the Ulaanbaatar City Administration. Unfortunately, I haven't been included in any support yet. We did not ask for anything very big to extend our factory. In order to have raw materials and production reserves, I asked for 100 million MNT in support, on the condition to repay it in two years. If 2,000 cubic meters of waste was recycled, the income of society's vulnerable groups and jobs would increase, and 6,000 tons of cement, armature, and wood would be preserved. Moreover, producing over two billion MNT worth of buildings and city necessities would benefit Mongolia and not only our interests. I will make it clear, we can produce column fencing for drinking water well security, 40,000 posts for highways and railways, sanitary sewer grates, and so on. We really can't use the reserve we have. So, in your opinion, how should we improve the waste recycling facilities? Over 1,000 tons of waste is thrown out in a day, out of which only 20 percent is reused. The vulnerable groups created a waste market. JICA's survey, worth ten billion USD and conducted for seven years, resulted in a waste recycling facility which was built with cooperation from Korean investment which wasted six billion MNT, the Tsagaan Davaa waste recycling facility, and garbage bags that cost seven billion MNT. They were all a way of laundering money. Still now, projects that launder money are being implemented. Why do they not support small factories which are doing something real? If we have some support, Mongolia will have 30,000 posts in reserve and we would prohibit wood and concrete posts. Recently, a tender selection for a waste recycling facility was held, but they chose an unknown company which had not even worked in this sector for one month. They claim they can produce patented fuel from a ton of waste in a day with two shifts of 60 people. Interestingly, JICA's study showed that this fuel can't be used in Mongolia, and there is not a dedicated stove for production, so it will give off toxic fumes. What will we do with over 300 tons of poison? For all these things that are being directly referred to, there is no one responsible for them in this field. May 29 (news.mn) In accordance with activities in the fight against terrorism, 15 members of staff from government agencies attend a short-term counter-terrorism exercises in Turkey between May 24th and 31st. It included meeting and interviews on improving the legal environment and attendees saw the structure and activities of the department to fight against terrorism. Participants included Mongolian staff from the General Intelligence Agency, the General Police Agency, the Armed Forces, the General Authority for Border Protection, the Customs General Authority, the General Department of Taxation, the Ministry of Road and Transport, the Ministry of Environment and Green Development, and the National Institute of Forensic Science. Mongolian and Turkish parties agreed to expand further bilateral cooperation between law enforcement agencies and to conduct bilateral trainings. The Ambassador of Mongolia to Turkey, B.Batkhishig, received Mongolian delegates at the Embassy of Mongolia in Turkey. May 29 (news.mn) The Minister of Foreign Affairs of Mongolia, L.Bold, made an official visit to the Kingdom of Sweden on May 26th. Mongolia and the Kingdom of Sweden are celebrating their 50th anniversary of the establishment of diplomatic relations. Mongolia and Sweden have actually had more than 50 years of good relations since the first Swedish business arrived in Mongolia and settled their business. This visit to the Kingdom of Sweden is the first visit by the Foreign Affairs Minister of Mongolia after the visit by President Ts.Elbegdorj in 2012. In the scope of the 50th anniversary of diplomatic relations and the official visit to the Kingdom of Sweden, a wide range of activities in multiple fields have been organized. During the visit, Minister L.Bold and the Swedish Minister for Foreign Affairs Carl Bildt held official talks over bilateral relations and cooperation and exchanged views on international issues. Swedish Minister Carl Bildt said that Sweden is ready to support Mongolia to chair the 5th Annual Freedom Online Coalition Ministerial Conference in Ulaanbaatar. Minister L.Bold also had talks with the Swedish Speaker of Parliament, Per Westerberg, and Minister for Public Administration and Housing, Stefan Attefall, over opportunities of inter-parliamentary relations, public administration systems, and exchanged views on cooperation in public administration between the two countries. Ulaanbaatar, May 29 (MONTSAME) A delegation headed by D.Bat-Erdene, the Defense Minister of Mongolia, headed Thursday to Singapore to take part in the 2014's international summit of the Shangri-La Dialogue (SLD). 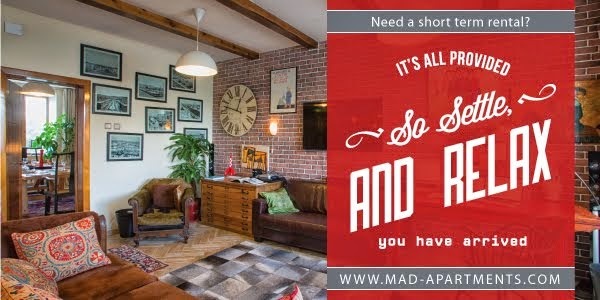 The action is to run May 31-June 2. On the fields of the summit the Minister will hold one-to-one meetings with his counterparts from the USA, Japan, France, Singapore, Indonesia and Myanmar to exchange views on the relations and collaboration in the defense sector and on regional matters. Headquartered in London, the International Institute for Strategic Studies (IISS) has been running the SDL since 2002, usually early June. Mongolia is participating in the summit since 2003, attaching a great importance to the cooperation with the IISS. The summit serves to cultivate a sense of community among the most important policymakers in the defense and security community in the region. Government delegations make the best out of the meetings by holding bilateral meetings with other delegations on the sidelines of the conference. While primarily an inter-governmental meeting, the summit is also attended by legislators, academic experts, distinguished journalists and business delegates. May 29 (UB Post) Ambassador Extraordinary and Plenipotentiary from Mongolia to the Russian Federation spoke to www.news.mn regarding Prime Minister N.Altankhuyag's working visit to Saint Petersburg, Russia to attend the St. Petersburg International Economic Forum. Upon the conclusion of the forum, geopolitical issues might turn positively to Mongolia. Also, several meetings beneficial to our economy were held. Do you think it can be considered that the Ukrainian crisis has influenced that? How much new progress do you think will be made in the relations between the two countries? It can't be said that Ukrainian issues are beneficial to us. Russia submitted their mission, or aim, in fall of 2013, to put Siberia and the Far East in circulation during the 21st century. In particular, President Vladimir Putin already imposed duties on all levels of state organizations after submitting that mission. Russian policy has turned to our side. Meanwhile, we are adjusting our operations towards strategic development tactics with Russia. Maybe the Ukrainian situation can intensify our policy. What other issues should be touched upon besides the issues discussed during the meeting? What is your position on resolving the reciprocal visa exemption issue? I think Mongolia should be a close strategic partner to its two neighboring countries. This close partnership has been developing impulsively with the southern neighbor, and partnership with our neighbor in the north has been left behind. Thus, this difference should be cleared out and the interests of our two neighbors should be balanced. The main goal of the Prime Minister is to balance it, in case the balance is lost. Mongolia neighbors only two countries. In terms of the visa exemption issue, I think Mongolia should consider how it can resolve the issue with China. For instance, it is a little bit complicated if China, with a population of almost one billion 500 million citizens, visit Mongolia without a visa. Very specific management should be made regarding the visa exemption issues. This visa issue has been discussed for a long time. As I understood it, President Ts.Elbegdorj gave the Russian side a positive response during the meeting in Shanghai. Russians expect that. We should look at the issue from the perspective that it might be economically beneficial to our country, as the trade balance between our countries has been lost. There are things that can't be planned at the national level but can be done at the company level. I believe that the opportunities to even out the difference lie in bringing the issue to the individual level, or to the same level that our citizens trade in China. Does that mean that trade between Mongolia and Russia is on an individual level? We can't evaluate it on an individual level, because there are many large companies that import petroleum products. But there are only a few trading companies. We intend to sell as many things as possible to Russia, and Russia has the same intention, however this concordance is not being created somehow. I can't say which factors influence this, but I believe that the state and government are responsible for creating a pleasant environment and conditions, and finding solutions when economic turnover is active. If the reciprocal visa becomes available for citizens of our two countries, I believe that economic turnover will become active. Russia cooperates with Mongolia in many sectors. For instance, Russia has become the main base to prepare specialists. Will the number of Mongolian students to study in Russia be increased? Recently, Prime Minister N.Altankhuyag met President of Russia Vladimir Putin and held talks on a mid-term program to develop bilateral, strategic partnership. There are several large sectors within the strategic partnership, such as the economic sector, humanitarian relations etc. Humanitarian relations are in the education sector. Of course, this includes the issue of educating students. Also, a 10 to 15 year education program should be implemented in Mongolia. Russian education helped to upgrade the Mongolian mindset and brought us closer to Europe. I think Russian education should be supported. May 29 (UB Post) German Chancellor Angela Merkel and President Ts.Elbegdorj initiated the German-Mongolian Institute for Resources and Technology (GMIT) in 2011. GMIT contributes in fulfilling the demand for specialists in the mineral resource sector, improving value adding processes and demonstrating international standards of education in Mongolia. The following is an interview with the managing director of GMIT and State Honored Ph.D. Ch.Altannar, highlighting important aspects about GMIT. GMIT is now ready for admission. Can you elaborate on the institute and why it was established? During Chancellor Angela Merkel's visit to Mongolia in 2011, President Ts.Elbegdorj initiated to establish a collaborative institute with Germany's support. With the chancellor's support, GMIT was established. In accordance to this agreement, the Mongolian Ministry of Education and Science (MES) and the German Ministry of Economic Cooperation and Development signed a memorandum of understanding in 2012. During the visit of L.Gantumur, Minister of Education, to Germany in early 2013, the establishment of the institute and its sustainable development were discussed. In September 2013, the institute officially began its operation with an engineer training program. Highly skilled engineering specialists are urgently in demand in Mongolia. We also needed to prepare engineers who meet international criterions as many large corporations have settled in Mongolia. GMIT was established to prepare specialists of modern engineering technology and conduct international-level training and research. Capabilities of German engineers are recognized throughout the world. Our objective is to become a benchmark institute for not only in Mongolia but also in other countries. GMIT is a collaborative institute. What sorts of schools are you working with? We established a partnership with a consortium of prestigious German universities. Currently in the consortium, we've joined with Freiberg University of Mining and Technology, the biggest mining university in the world, and RWTH Aachen University, one of Germany's reputable universities. Many other famous schools have expressed their interest in joining this consortium. Although Darmstadt University of Technology and Bochum University aren't partner schools, they've been cooperating with us in many areas. The first admission will be in autumn. How high is the criterion? We'll take entrance exams on July 8 and 9. We started preparing students for the engineer training program since last autumn. Students who've successfully finished the training program will be accepted to our bachelor class. Engineering students mainly focus on studying mathematics, physics and chemistry. We set high and strict criterions since we're aiming to prepare highly skilled engineers. All bachelor classes will be taught in English; therefore, new entrants must pass high criterions to enter the institute. Examinees must have scored higher than 500 point in at least two subjects from English, mathematics, physics and chemistry in the EYESH examination (general education exam) to apply for GMIT. Our institute will take tests on natural science and English. 50 percent of the natural science test will consist of mathematics, 30 percent of physics and 20 percent of chemistry questions. There's a higher and lower threshold mark for the examination. Students who pass the higher threshold mark will be accepted to the bachelor class straightaway and those who pass the lower threshold mark will be enlisted to a one-year training class. For what majors will students be enrolled in the bachelor class? We'll take admission for mining process engineering, mechanical engineering and environmental engineering. We didn't choose these majors randomly. We did a detailed research in many areas before we established the collaborative institute of Mongolia and Germany. We did a survey in over 80 active factories and concluded that specialists for these three majors are crucial. We're planning on preparing specialists for renewable energy and other engineering sectors in the future. This year, we're planning to admit 125 students for both bachelor and training classes. We'll prioritize on training skilled students instead of its number. We're assuming that we'll get around 400 students in the academic year of 2016 to 2017 and 500 students in the academic year of 2017 to 2018. In the future, we'll begin masters and doctorate programs. We planned to establish a masters training class in 2016 but it's possible to begin earlier. GMIT is aiming to become an institute that meets international standards. Does that mean graduate diplomas provide international accreditation? Our objective is to be able to meet standards of accreditation bodies of world prestige schools. We share the same objective with our collaborating partner schools. Starting from training preparation, including the development of curriculum, training environment and teacher selection, we have been working towards providing international accreditation standards. The German Academic Exchange Service is responsible for this and the MES is working to implement reform program for the quality of higher education and transform public universities to research institutes that meet international standards. Within this framework, the ministry is seeing GMIT as a part of the reform and are working and supporting us very closely. How did you develop the institute's curriculum? It was said to have been developed after concrete research. Is it true that you surveyed factories and company representatives? Germany-Mongolia joint team of professors worked on the training program. This team worked on developing the program in Berlin in February and in Mongolia in March. During the second meeting, they invited representatives of companies to enquire about their opinions. International standards require universities and companies to have a very deep relationship. We're planning to work with companies in accordance to this standard. How did companies receive this initiative? This sort of standard has been lost for over thirty years in Mongolia. It's true we had some difficulties in making the other party understand this initiative. They knew and understood that it was necessary but didn't know how to implement it. Regarding this, GMIT invited representatives of active companies and universities for a discussion session about whether University-Factory Association is necessary in Mongolia, which was organized by the MES, the Office of the Governor and Liberal Houses for Research. Both sides agreed that this cooperation should operate in a broader scale. For the training, practical work is very important to engineering students. During the four years in GMIT, students will spend 120 days working and doing practical work in factories. This is a form of university-factory cooperation. In Mongolia, factories spend additional expense on training their specialists. If students are able to do practical work while studying, we'll be able to train specialists capable of working while studying. During our meeting, companies expressed their interest in re-training their specialists at GMIT. Does that mean that companies will be able to invest in their future personnel? Exactly. We've have a tradition of training personnel with scholarships. Several companies wanted to give scholarships to promising students in GMIT. Since GMIT is a collaborative school, will both sides provide investments? Can you elaborate on this matter? In the first stage to establish the institute, a joint investment from the two countries' government is being established. With investments from Oyu Tolgoi from the Mongolian side, a campus with 160 student dormitories and school building for 600 students was built in Nalaikh and is now ready for commissioning. Investment from the German side includes travel expenses and salary for German teachers. We're planning to gather investments for building another dormitory, student service center and a basketball court. Many will want to have their children study in GMIT instead of making them study abroad. What is GMIT's tuition fee? Similar to standards of Germany, 240 credits are required during four years in the bachelor class. It costs 116 thousand MNT for one credit. Around seven million MNT is estimated for bachelor class and 3.5 million MNT for the training program. We'll provide promising students the opportunity to study by giving scholarships. Depending on their rank from the entrance examination, the first 10 students will get 100 percent discount from tuition and 50 percent to the next 10 students. They can continue to receive scholarships in this manner with their academic results. All discounts provided by the state budget for grants and loans to children of vulnerable groups will be effective in GMIT. As previously mentioned, students will have opportunities to receive scholarships from companies as well as do practical work in German factories. Students with good grades can also study in foreign schools as exchange students for one to two semesters. The GMIT curriculum is the same as German schools; therefore, as soon as students graduate, they can study in German universities for their master's degree. Studying in German universities is very desirable as there isn't any tuition fee. Most people know you as a young Mongolian mathematician who received state honors through his internationally recognized work. When were you appointed as director of GMIT? Since January, I worked as the managing director of GMIT. In regards concerning the structure of GMIT, a whole Mongolian and German joint team has been working together. The system for institutional structure and recruitment for teachers and administrative staff was done according to international university principles. You can interpret it as creating an international university environment as well as giving Mongolian students the opportunity to get the same education as world recognized German engineers in Mongolia. All of this is more than enough reason for me to work here. Can you tell us about your education background and work experience? I graduated from the Mathematics School of the National University of Mongolia in 2002, got my master's degree in applied mathematics in Florida University in the USA in 2005, got my master's degree in 2007, and from 2007 to 2009, I worked in the school I graduated from. From 2009 to 2011, I worked at the Imperial College of Great Britain and came back to Mongolia. After coming to Mongolia, I worked at the Mongolian Institute of Mathematics and the Economics School of the National University of Mongolia, now known as Business School, before joining GMIT. Ulaanbaatar, May 29 (MONTSAME) An anti-cancer national campaign is being organized successfully for the fourth consecutive year through collaboration between Khan Bank, the National Cancer Center (NCC) and Mongolian National Broadcaster. This year, the NCC's specialists, divided into five groups, are working in nine different high risk aimags. The activities include circulation of information on cancer prevention among the public, delivery of specialized trainings on early diagnosis and treatment for rural doctors, screening of high risk groups, and training for Khan Bank volunteers who are to promote cancer prevention in localities. The started May 12 in Darkhan-Uul aimag campaign has continued in Selenge and Zavkhan provinces on May 18-25. A total of 4,874 people were screened, 22 were diagnosed with cancer, 63--with suspected cases, 194--with cases causing other diseases, and 21 urgent surgeries were performed. An "Early Detection of Cancer, Diagnosis and Treatment" training was run, and 130 countryside doctors and specialists and 138 employees got involved in volunteer programs. The campaign is continuing now in Gobi-Altai province. Ulaanbaatar, May 29 (MONTSAME) A State Honored Sportswoman and World champion M.Urantsetseg led the judo rating for women's 48 kg category with 2,598 points, according to the latest rankings of top judokas released by the International Judo Federation (IJF) on Tuesday. She was followed by a Brazilan judoka and Olympic champion Sarah Menezes who has 2,062 points; and by a Hungarian judoka Eva Csernoviczki. In the men's -60 kilo category, two Mongolians G.Boldbaatar (1,516 points) IMS and D.Amartuvshin, a silver medalist of the World Championship (1,428), were ranked at fourth and fifth places, respectively. Another Mongolian G.Kherlen stood at 10th place in this category. An international master of sports D.Tomorkhuleg went down to fourth place in the men's 66 kg category, having 1,324 points, where a Brazilian judoka Charles Chibana topped the category with 1,786 points. Other top judokas of Mongolia S.Nyam-Ochir and Kh.Tsagaanbaatar sank to 7th and 10th places, respectively, from higher places. An Olympic champion N.Tuvshinbayar was ranked 16th place in the men's -100 kg. In the women's -57 kilo, an international master of sports D.Sumya was listed at 7th place. Others were not ranked at higher places. Mongolia's version of Tony Awards? Winners of International Drama Festival "Saint Muse 2014"
May 29 (infomongolia.com) On May 19-20, 2014, the International Drama Festival "Saint Muse" or "Gegeen Muza" took place at the Central Cultural Palace in Ulaanbaatar organized by State Academic Drama Theatre of Mongolia (SADT), where over 80 artists from Mongolia, Egypt, Serbia, Tyva Republic, Russia and Inner Mongolia, China have competed in four categories. In the past ten years, the Drama Festival had been held in a form of a contest announcing and awarding the best plays staged in Mongolia among drama performances and play-staging of national drama theaters. Last year, the festival advanced to become an international event, with a participation of judges from Russia, Canada, Serbia, Macedonia and Kosovo. This year, twenty-one nominees from Egypt, Serbia, Tuva and Inner Mongolia along with Mongolian artists have competed in the categories of Drama, Musical, Mono Play and Children's Play. The judging panel was composed of famous actor and producer Elizabeth Hess from the International Theater Institute. Winners of the International Drama Festival "Saint Muse 2014"
Best Music Composer - M.Odbayar, "X-Tuts" Production, "Seruun Khasyn Nuuts"
Best Scene Decorator - S.Ariunbold, SADT, "Don Quixote"
Best Supporting Actor - G.Amgalanbaatar, SADT for his role as Sancho Panza in "Don Quixote"
Best Supporting Actress - State Merit Artist N.Suvd for her role as Mrs. Luo in "Seruun Khasyn Nuuts"
Best Male Main Character - Merit Artist S.Jargalsaikhan for his role as Quixote in "Don Quixote"
Best Female Main Character - Merit Artist I.Odonchimeg, X-Tuts Production for her role as Syueko in "Seruun Khasyn Nuuts"
Best Director - B.Baatar, SADT, "Don Quixote"
Best Music Composer - Kh.Dornoo, Inner Mongolia, "The Story of Mongol Chess"
Best Supporting Actor - B.Uuganbaatar, "Selengiin Dolgio" Ensemble, Selenge Aiamg, "Goolingoo"
Best Supporting Actress - Merit Artist B.Sarantuya for her role as the Nurse in "Romeo and Juliet"
Best Male Main Character - A.Odsuren, Musical Drama Theatre of Dornod Aimag, "Van Khunii Ur"
Best Female Main Character - N.Ariunchimeg, Musical Drama Theatre of Dornod Aimag, "Van Khunii Ur"
Best Writer - S.Bayarsaikhan, "Goolingoo"
Best Director - G.Navchinkhuar, Inner Mongolia, "The Story of Mongol Chess"
Best Scene Decorator - S.Myagmar, Black Box Theatre, "Krapp's Last Tape"
Best Male Main Character - G.Munkhjargal, Black Box Theatre in "Krapp's Last Tape"
Best Female Main Character - L.Erdene-Ochir, Black Box Theatre in "Soliorol"
Best Writer, B.Galaarid - President of Mongolian Writers Union, "Melody of the Sky"
Best Director - D.Sangibat, "Melody of the Sky"
Best Music Composer - B.Munkhjargal, "Jaakhan Sharga" Theatre of Sukhbaatar Aimag, "House of Cats"
Best Scene Decorator - Yo.Gantulga, "Jaakhan Sharga" Theatre of Sukhbaatar Aimag, "House of Cats"
Best Supporting Actor - B.Otgonbat, SADT for his role as the Grandmother in "Biography of Norov"
Best Supporting Actress - D.Bolortuya, "Jaakhan Sharga" Theatre of Sukhbaatar Aimag for her role as the Pig in the "House of Cats"
Best Male Main Character - A.Chinguun, SADT for his role in "Biography of Norov"
Best Female Main Character - A.Todgerel, "Jaakhan Sharga" Theatre of Sukhbaatar Aimag for her role as the Owner of the "House of Cats"
Best Director - Ch.Tuvshin, SADT, "Biography of Norov"
May 29 (UB Post) I currently teach general and professional English to aspiring painters, secretaries, graphic designers, and tour guides. As I quickly learned, vocational English programs require a degree of specialization not found in most other secondary and tertiary educational contexts. Regardless of the type of program, vocational students need not only practical English vocabulary for their field but also a working knowledge of industry-specific skills, norms, trends, and best practices necessary for their profession. These are lofty goals for educators in vocational institutions but ensuring they are met is vital to the future of Mongolia's economic growth. Drawing from my personal experiences, this post will address universal difficulties facing technical English programs, survey issues in the field of vocational education as a whole, and offer suggestions for making Mongolia's technical and vocational education system as strong as possible. Nevertheless, it's imperative for all students to understand the importance of mastering English relevant to their field. It doesn't matter the profession in which a student is interested, in the modern global economy customers, clients, investors, managers, business owners, and colleagues in Mongolia are more likely than ever to speak English as a first or second language. Possessing the adequate skills to communicate with people in a workplace setting is invaluable. Further, in order to perform at a high level and continue to develop professionally, workers in all industries should consult up-to-date resources. Many of these materials are only available in English which leave non-speakers and non-readers behind. Unfortunately, educational institutions all over the world are struggling to provide vocational students with practical skills to make them employable — and not just English skills. There are several reasons for this. First, too many higher education institutions in Asia continue to use dry and outdated methods of English instruction. Reading, translation, and rote repetition of texts is not an effective strategy and leaves students bored and unmotivated. Instead, methods should be made more dynamic and include activities aimed at increasing the production of spoken English related to the tasks pupils will be performing in a real life environment. Always popular among my students, games and competitions should be incorporated into the classroom on a daily basis to keep students' attention and increase retention of knowledge. Also, field trips, hands-on seminars, and workshops should be used to supplement students' English knowledge of their disciplines in a setting that replicates their real-life work environment. For instance, today I'm going to an art gallery with my students. A second major problem with vocational institutions is that many schools lack sufficient communication with professional organizations, ministries, and companies within their fields. This is the case in Mongolia but it's not unique in that regard. The result is, no matter how hard students work, they're not being adequately prepared for a real workplace environment, leading to poor employment prospects. Many students have little faith they are gaining relevant or employable skills, which further demotivates them. Curricula must be designed in coordination with industry leaders to guarantee that the skills-focus, English vocabulary, and methodologies of instruction are up-to-date, relevant, and effective. Furthermore, student internships and apprenticeships should be required for graduates of all high-quality programs and institutions. I'm very pleased with Rajiv Gandhi's summer internship program for hospitality students who gain real-world skills as hotel staff each year. Opportunities for practical experience should be facilitated by every vocational school. Emphasis should be placed on opportunities where pupils can practice both professional and English-language skills. It's impossible for students to be employable upon graduation if they have no work experience or training. Databases should be made of hired graduates from every department in a vocational or technical institution to assess the employability of students. Schools could then use this information to find opportunities for further internship placements and partnerships. Importantly, this employment information should also be required of every vocational school by the Ministry of Labor in order to better assess the needs of the labor market. With sufficient information, Mongolia's Ministry of Labor could more effectively guide its vocational and technical education system to supply the correct number of graduates to meet the current demand for jobs in each economic sector. This could benefit not just students and vocational and technical schools but Mongolia's entire economy. Why have massive programs for auto workers when there are not enough factory jobs for all the trained graduates? Why have small or non-existent programs for construction and mining when there is still a large demand for workers in these sectors? Sadly, some companies are not currently able to meet their needs for skilled workers domestically and may instead hire better-trained but more expensive foreign employees. With statistics on student success the Ministry of Labor could then provide incentives for schools to expand programs in sectors of strong economic growth and cut programs that waste valuable tax money as well as students' and instructors' time. These changes are difficult but necessary to ensuring both the immediate and long-term success of Mongolia's economy. There's much to be done to improve vocational English and technical educational systems to the point where both graduates and businesses are reaching their full potential. Most of these issues are not specific to Mongolia but also found in many other countries, including the United States. However, there are many causes for hope. My students work very hard and many show a very high aptitude for learning English as well as learning vocational skills. If educational administrators, government representatives, and business leaders convene to discuss these critical issues, and consider policy changes, Mongolian vocational students will have an even brighter future.